I saw this on Pinterest and had to make one for my cats. My daughter worries that when I get old I will become a “crazy cat lady” I believe this project brought me one step closer! I collected a bunch of boxes from work and got asked “are you moving?” about 20 times. The directions for the one that inspired me are here. 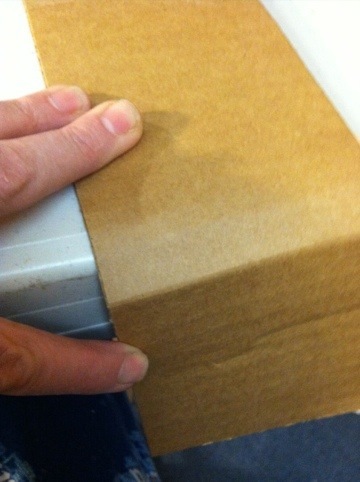 Once I had my boxes I took them apart and flattened them. 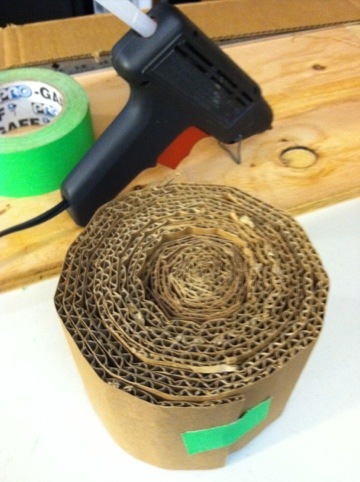 I cut them into 4 inch wide strips and when I had a pile of strips I started rolling. 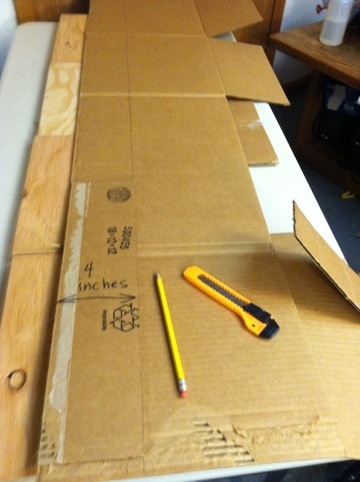 Before rolling I dragged the strip over the table edge so it would be easier to roll tightly. 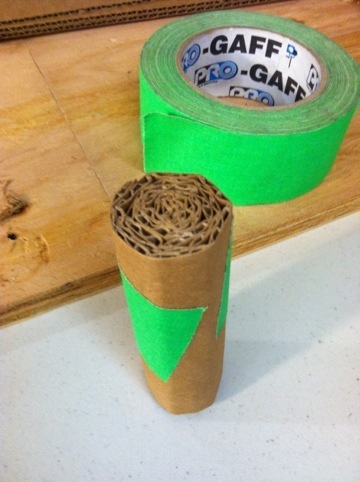 I started with a shorter piece from one of the flaps and rolled it as tight as I could and secured it with tape. 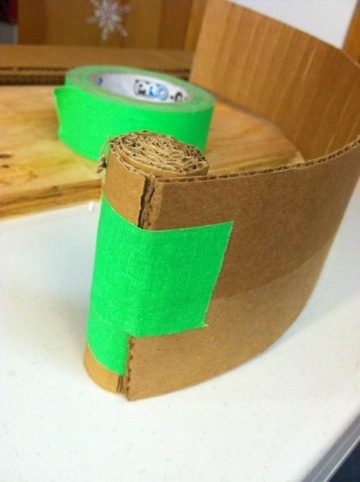 I grabbed another strip and taped it to where the last strip had ended then began rolling again. 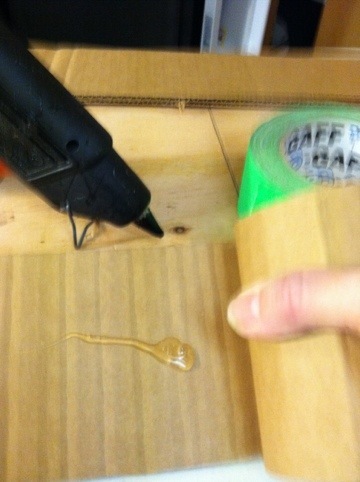 I used my glue gun here and there to hold it together on the longer pieces. 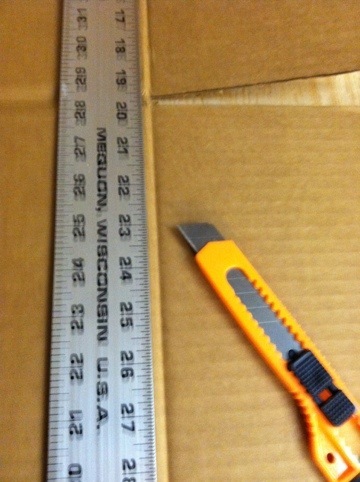 The glue sticks were the only expense for this project, of course I used a coupon to buy them! This is the bottom you can see it isn’t smooth or even the top is a little better. I kept adding cardboard until my circle was big enough for my fat cat to lie comfortably on it. I rubbed some catnip (that I grow in my yard) into the top and any cracks I could wedge it into. 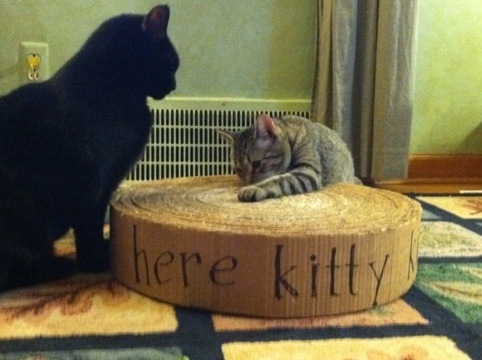 I finished it off by writing “here kitty kitty” on it so they would know it was theirs. 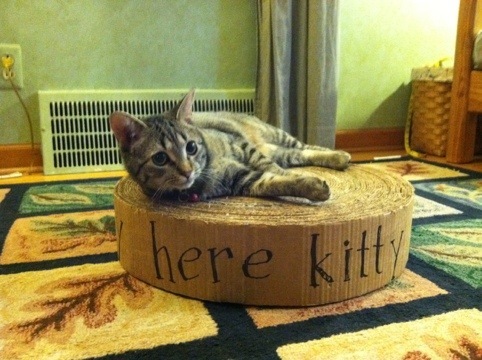 The cats love their scratching pad and like playing games like King of the Scratch Pad which entertains the whole family not just the crazy cat lady! I made one of these for my boys out of the box from my new TV. It’s not huge, but I think the boys will like it. I used the box to a mega-pack of Cadbury fingers for the outside as a nod to Neo and DiNozzo’s Anglophile mummy (me!). Juliane- I hope your boys have lots of fun with their new scratch pad. I like the nod to Cadbury! Awesome idea and tutorial. Definitely going to try it.